Knee walls are commonly used in attic spaces. 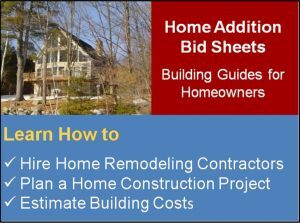 Attic knee walls are short walls that are usually less than 4 feet in height and extend from the floor of the room to the roof rafters. 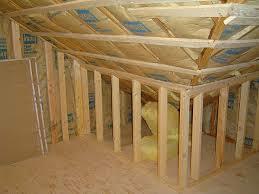 Attic knee walls are frequently used in attic conversion projects to define the shape of the finished living space. Besides defining the finished living space, knee walls are also used for housing built-in cabinetry and for creating low-height closet space. Framing a knee wall is fairly straight forward to do. Usually it is best to start by snapping a chalk line on the roof rafters at the desired height of the attic knee wall. Then use a measuring tape to measure the distance from the attic floor to the chalk line. 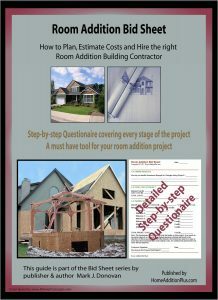 This measurement will determine your wall stud height. Next, hold a small section of 2×4 vertical (plumb) so that one end of it is sitting flush up against a roof rafter. Using a pencil, scribe a line on the 2×4 to obtain the roof rafter angle. Transfer this scribed line onto the required number of vertical wall stud members. Next, cut the ends of the 2x4s on the scribed lines. Now, cut the other end of the vertical stud members to the length measured between the roof rafters and attic floor, MINUS 3 inches to take into account the bottom and top plates. Also cut to the appropriate length the bottom and top wall plates. With all the lumber cut, frame the attic knee wall on the floor of the attic. Use either 16 penny nails and a hammer, or a nail gun to fasten the lumber together. With all the lumber cut, frame the knee wall on the floor of the attic. Use either 16 penny nails and a hammer, or a nail gun to fasten the lumber together. Once you have framed the attic knee wall, stand it up and move it into position up against the roof rafters and attic floor. The top of the knee wall should line up with your chalk line. Also use a level to make sure the knee wall is perfectly plumb. Then use 16 penny nails to fasten the attic knee wall to the roof rafters and attic floor. Make sure you nail the bottom plate of the attic knee wall into the attic floor joists to ensure a rigid knee wall. And that’s all there is to it on how to frame a knee wall in an attic.